Johnny White was totally unknown to me until I bought this first class deep ballad. The address on the label is Bailey, NC and I guess that’s where Johnny came from. Surely (Someone Need s Love) was cut in the mid 70s but as far as facts go that’s about it. 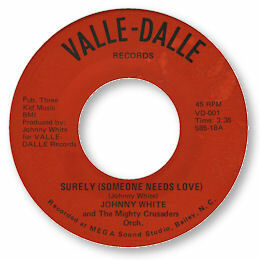 But what’s undeniable is that Johnny gives an excellent vocal performance on his own song and that the Mighty Crusaders back him up equally well. It seems that this sort of southern soul was alive and well in the Carolinas at the height of the disco boom I'm pleased to say. UPDATE ~ Sami Dariush has kindly written with more info on Johnny and his recordings, including confirmation that the Elite 45 is by him. He adds that Johnny has said to him that "The Mighty Crusaders was the former name of The Elite Band. Valle Dalle Records was owned by a gentleman named Chuck Harris. "Physical Health and Trim" was my very first recording." Thanks to Andy Aitchison and to Sami Dariush for all the extra info..